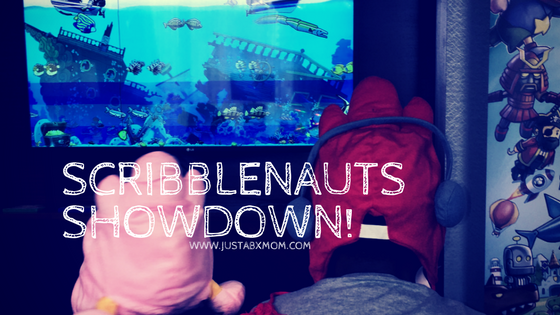 Scribblenauts Showdown came out on March 6th and we were blessed to get the chance to check it out before that. JustaBXgirl and her godbrother got to play it at a media event and neither of them wanted to leave the game. Suffice to say each of them asked when they could get the game. We were blessed to be given a code when the game was released and JustaBXgirl wasted no time getting down to business. She was happy to play at home and be able to design her own Scribblenaut. In fact, updating her look is always her first stop when playing the game. JustaBXgirl is just learning how to spell and read. This game is great for helping that along. We had a lot of fun plans for her Spring Break but then life happened and it meant that she would be spending a lot of time home with JustaBXgrandpa. Fortunate for us Scribblenauts Showdown kept her occupied and she didn’t even realize that she was still learning while playing. Showdown – Up to four players compete against each other in creative mini-games; “Wordy” mini-games challenge players to outsmart their opponents using words from the game’s vast dictionary, and “Speedy” mini-games put players to race against the clock to finish. JustaBXgirl enjoys the speedy games a little more than the wordy games because they allow her to play without building words. Versus – Two players go head to head in more than 25 different timed mini-games to add more variety to the gameplay. Sandbox – The series’ cherished creative playground where players can conjure nearly any object imaginable from an expansive dictionary of 35,000 words — and watch them interact in hilarious and unexpected ways. Even though this requires spelling, JustaBXgirl LOVES playing in the Sandbox. It is her first stop after updating her look. Scribblenauts Showdown is available now digitally and at all major retailers for the Nintendo Switch, PlayStation 4 and Xbox One. Oh yes we are gonna see if it is available for download on Xbox One. all day, lol. YAY learning games. You’ll have fun playing too! The Temperature Is Rising – 3 Thermometers To Keep You Cool!